In the West End Plan adopted by Vancouver City Council on November 20, 2013, one of the prominent heritage features is the creation of a heritage stroll along Cardero Street between Davie and Robson Streets. This strip of Cardero was selected because of the clusters of heritage homes and apartment buildings representing different eras in the West End. In coming years, the City of Vancouver along with the community will be creating this stroll. 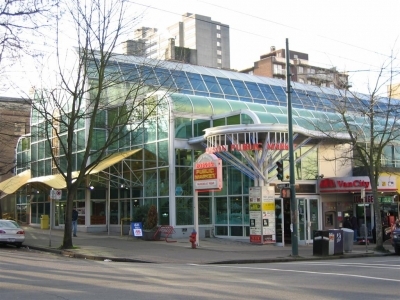 The Robson Public Market, built in 1985 at the corner of Robson and Cardero is well placed as the gateway to the Cardero Heritage Stroll. Structurally with its steel trusses, tubes, roof and framework it resembles other public markets, such as the Granville Island Market built at this time. In the Lower Mainland some of these markets are flourishing, some are barely hanging on and some have disappeared. 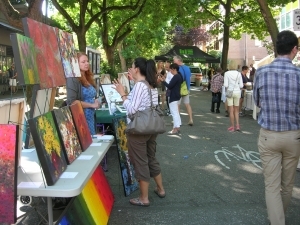 The community would like the Robson Market to be in the flourishing category. A mural on the lane wall representing the historical evolution of Cardero Street and the West End. A permanent interactive interior exhibit on the history and special features of Cardero Street. A permanent interior exhibit of local West End arts and crafts. Special days with art and music both inside and outside the market.